The LIFO Interpersonal Styles Inventory has been taken by over 8 million people in 20,000 organizations. This inventory (Life Orientations) enables participants to build confidence and self-esteem by understanding and appreciating their styles, strengths, and uniqueness. It provides a common language for talking about similarities and differences with others. Participants learn to avoid overusing their most preferred strengths; how to get help from people with different styles; how to become more versatile in their approach to people and problems; how to utilize individual differences to strengthen team effectiveness; and how to recognize other people=s most preferred channels of communication and appropriately tailor the message. These topics and others will be explored in a highly interactive format that emphasizes group exercises, facilitative discussion of articles, dialogue and reflective thinking. How can understanding your personal style enhance leadership performance? What are the four guiding philosophies that shape how people observe, understand, and behave in organizations? What are the strengths and vulnerabilities of people who possess the four guiding philosophies? How can leaders strategically tailor their communication approach to better resonate with the diverse styles of others? How can a manager find situations that capitalize on their unique strengths? How can an individual practice new behaviors to diversify their approach to leadership? How can a leader curtail behaviors that place limits on their success? Managers, supervisors, team leaders, professional staff, and those considering advancing to a supervisory position. 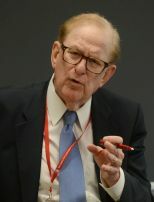 Donald G. Zauderer is Professor Emeritus of Public Administration at American University and former Senior Advisor at the Brookings Institution.